Transform the Labour Party into a Vehicle to Promote a New Socialist Vision? But assuming JC [Jeremy Corbyn] makes all the right calls, could it, a reborn Labour Party lead to a new call for an end to the madness of capitalism and exactly 130 years after Morris made his plea? Think about it. Transform the Labour Party into a vehicle to promote a new socialist vision? Who is kidding who here? Of course I welcome his victory but it may well be a pyrrhic one, already the corporate media is predicting JC’s end with a survey showing, allegedly, that only one fifth of something or other will vote for him in the next election. For more on this, see Our feral, lying, good for nothing media by Richard Seymour who deals very effectively with today’s front page story in the Independent which alleges that “Corbyn ‘loses fifth of Labour voters’”. So what else is new? Clearly those who voted for Corbyn could care less what the corporate/state media say about him. In fact I suspect many voted for him justbecause the corporate/state media did such an evil hatchet-job on him, especially so given how blatant the ad hominem attacks have been and continue to be. In this sense, it just reveals what an uphill struggle we’ve got and frankly, Jeremy Corbyn is not the solution, if anything he’s a symptom of the malaise that is our degenerate, late capitalism. Sitting in Parliament for thirty years and aside from attending the odd demo and signing petitions, he has grandstanded the rise of the corporate-security state (Fascism) in a political party that long ago gave up any pretense at being socialist, or even dreaming about the idea. JC is fully paid member of the professional political class. I hope you see my dilemma? For on the one hand JC does speak the truth to power but on the other he does it within the straight-jacket of corporate, party politics precisely where the power he challenges, resides. How are these two mutually exclusive positions to coexist? The truth is, they can’t. One will have to go. All it takes is for JC to make just one, ‘ill-considered remark’ and it’ll be another ‘Night of the Long Knives’ for JC. In a media-saturated environment people are made and broken overnight. Taking care of this throwback to the past, wont be a problem. Let’s face it, Corbyn is an ‘aberration’ in the scheme of things. Agreed, he is a spanner in the works of faux democracy, but any loyal (to the Party) Labour MP would not have run for the office in the first place (we saw one rumour, again in the Independent, alleging a close advisor to JC advocating that he pull out of the race, no doubt ‘in the interests of Party unity’). But what does JC have to lose? He’s 71 and coming to the end of his political life, so hopefully even if he crashes and burns, his corpse will light a fire elsewhere. Whatever. 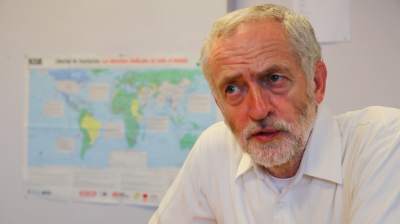 What’s important about Corbyn is the fact that for the first time in public, issues are being raised that the corporate/state media will not go near, hence the vicious attacks on JC which are all designed not only to discredit him but perhaps even more important, divert our attention away from these issues. The question is; can the support for Corbyn be transformed from a flash-in-the-pan into something more deep-rooted and sustainable? Is the current left capable of taking on this task? Jeremy Corbyn is secretary of Stop the War Coalition, itself effectively an extension of the Socialist Workers Party, the largest party on the left. I’ll be blunt, I have no time for Stop the War or the SWP, they have both played opportunistic games and worse, they have failed miserably to utilise the support they gained in the initial opposition to Blair’s invasion of Iraq. And elsewhere on the left, well frankly there’s nothing aside from a denuded and fragmented Communist Party and other odds and sods. In actuality, the bulk of the British left is little more than a figment of the imaginations of a few lefty academics, who have made a living out of writing about each other, or am I being too cruel? No, I don’t think so. For the most part, opposition is fragmented into possibly hundreds of single issue campaigns of one kind or another, some of which are anti-capitalist, most of which are not. But mention the word socialism though and you’re dead in the water which makes it very difficult to connect issues to their source: capitalism. The left even has a problem in identifying on whose behalf it’s allegedly conducting class war. Thus endless battles are fought over what constitutes the ‘real’ working class we should (or shouldn’t) be fighting for? Our left, in all its various forms, exists in a world it was never made for. Born in the 19th century out of the struggles of the industrial working class, it now lives on in a world that no longer has an industrial working class to speak of, advanced or otherwise. And don’t forget we are still citizens of Empire which ‘bestows’ certain favours upon us. Not all of us to be sure but enough of us to make it matter when it comes to supporting or at the very least acquiescing to our murderous ways with the world. I wish I knew. Why did Syriza cave in to the international capitalist mafia? Did it not trust the folks who elected them to support them in their struggle with the money men? Or perhaps those at the top of Syriza are just too damn comfortable to really care about the people that elected them? Maybe they needed a few nights of sleeping on the street?